The Basilica of San Simpliciano is a church in the centre of Milan, Italy northern, the second oldest in the form of a Latin cross, first erected by Saint Ambrose. It is dedicated to Saint Simplician, bishop of Milan. Latin cross plan, with a four-bay nave and two aisles. The site of the present church was occupied in the 3rd century AD by a pagan cemetery. There St. Ambrose began the construction of the Basilica Virginum ("Basilica of the Virgins"), which was finished by his successor Simplicianus, who was buried there. A brick with the mark of the Lombard King Agilulf shows that repairs were made between 590 and 615 AD. In the ninth century the Cluniac Benedictines took possession of the church. 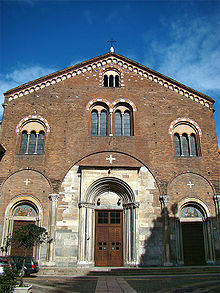 In 1176 the church became famous when, according to the legend, the bodies of the martyrs housed here flew as doves to the field of Legnano, landing on the City's Carroccio, (a ceremonial war waggon) as a sign of the imminent victory against Frederick Barbarossa's army. When the building was modified between the 12th and the 13th centuries, giving it the present Romanesque appearance, the original walls were preserved to a height of 22 meters. On the night of 6–7 April 1252 the body of Peter of Verona (later St. Peter Martyr) lay in state after his assassination. A great multitude came to watch vigil, and the origins of Peter's cult began, as people started to report miraculous occurrences. In 1517 it was acquired by the Benedictines of Montecassino, who remained here until 1798, when the convent was secularized and for a time turned into barracks. In the 16th century the Spanish governor Ferrante Gonzaga had the bell tower lowered by 25 meters. The dome and the side wings were also modified in 1582. Other interventions were carried out in the 19th century, with poor results, while the façade was reworked in 1870. In 1927 stained-glass windows portraying episodes of the battle of Legnano were added. On the façade, the arcades that surmount the portals indicate the presence of an ancient portico, now disappeared. The upper part, the most modified in the 19th century, has two mullioned windows in the centre, an upper triple mullioned window and decorative arches. Late Renaissance mullioned windows also decorate the bell tower. The interior is on the Latin cross plan, with a four-bay nave and two aisles. The transept is divided into two aisles. The side chapels have decorations from various eras, from Renaissance to Baroque, Rococo and Neoclassical. In the right transept is a painting by Alessandro Varotari (Il Padovanino) portraying the Defeat of the Cammolesi. Next to the apse entrance are saints frescoed by Aurelio Luini. The apse vault is decorated by what is considered Ambrogio da Fossano's masterwork, a wide Incoronation of Mary. Also on the left of the apse is the entrance to the small sacellum dedicated to the Martyrs of Anaunia, not before the end of the fourth century, as in a passage in Maximus of Turin's Sermo 81 Maximus designates himself a witness of the martyrdom of three missionary priests in 397 at Anaunia in the Rhaetian Alps. The western wall of the transept has a Marriage of the Virgin by Camillo Procaccini. ^ A series of articles by E. Arslan, "Qualche dato sulla basilica milanese di San Simpliciano", Rivista di archeologia cristiana 23-24 (1947-48:367-82; "La basilica paleocristiana di San Simpliciano a Milano", Actes du VIe Congrès international d'études byzantines vol. II (1951:15-24}; "Nuovi ritrovamenti in San Simpliciano a Milano", Bollettino d'arte 42 (1958:190-212); "Ultime novità a San Simpliciano", Arte lombarda 6.2 (1961:149-64). ^ Migne, Pat. Lat., LVII, 695.